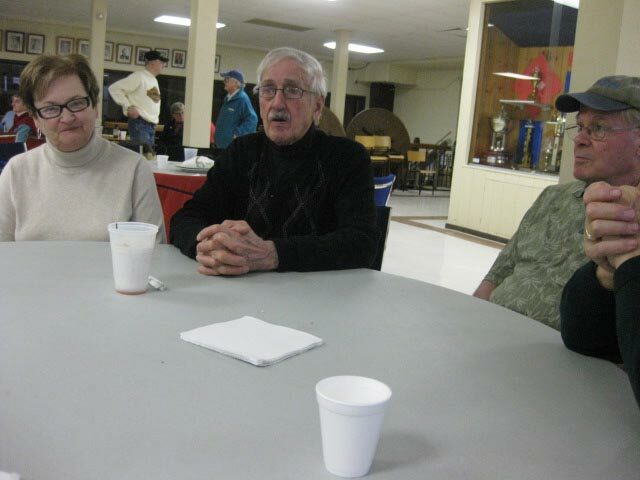 Here are some of the pictures from the 2010 Funspiel and Banquet. 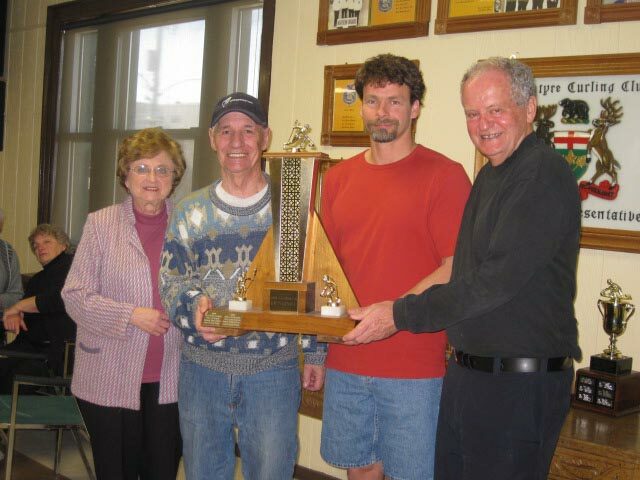 Pauline Gubbles and son Wally present the Parmalat Trophy (1st place ) to skip Len Comisso and vice Joe Harwood. Missing are second Bob Boegel and lead James McClinchey. 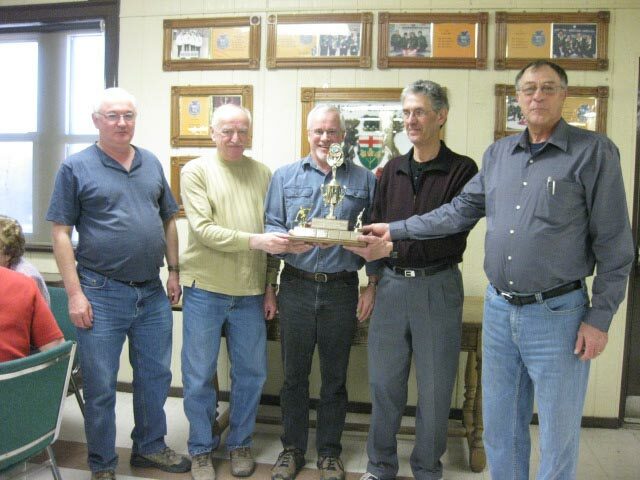 Ray Schizkoske presents the Parmalat Trophy (2nd place) to skip Guy Deslauriers, vice Neil McIsaac, second John Wilson and lead Ron Hueston. 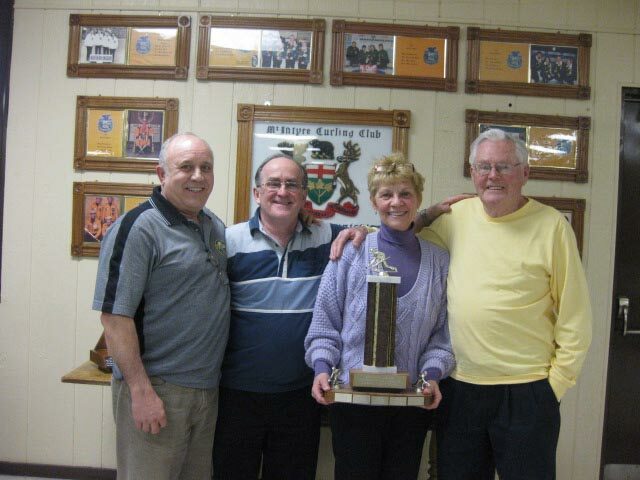 The Labatt Trophy (3rd place) went to skip Bob Armstrong, vice Rhea McKane, second Andre Clouthier and lead Marcel Turcotte. 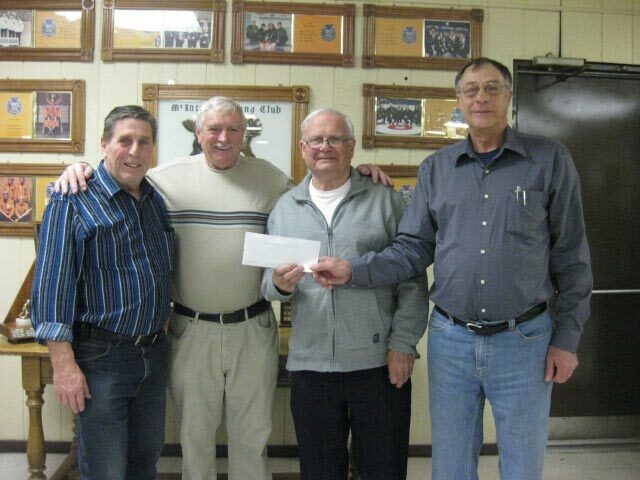 Ray presents a cash prize to forth place finishers skip Art Mousley, vice Louis Raymond, second Gilles Lebrun (missing) and lead Roger Ethier. Wednesday Curling League Pre Christmas Draw. 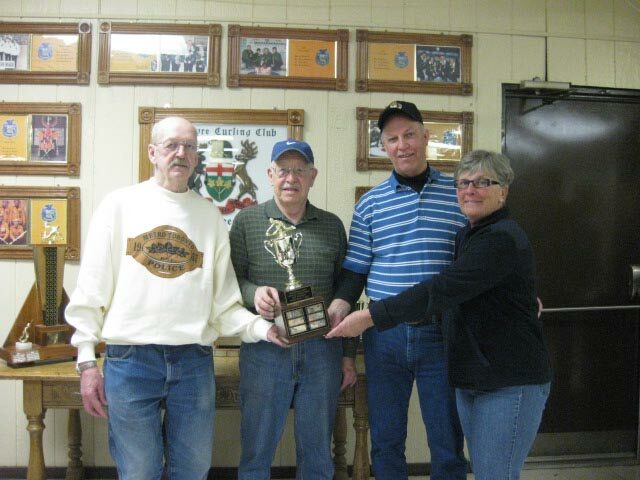 Bob MacDonald presents the MacDonald Feed Supply Trophy to skip Bill Vane, vice Grant Chevrette and second Marylin McAlpine. Missing is lead Murray Hall. 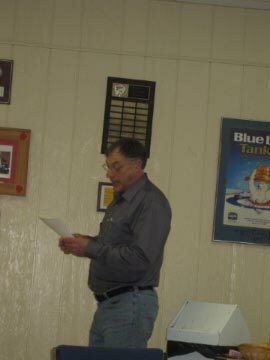 Wednesday Curling League Post Christmas Draw. 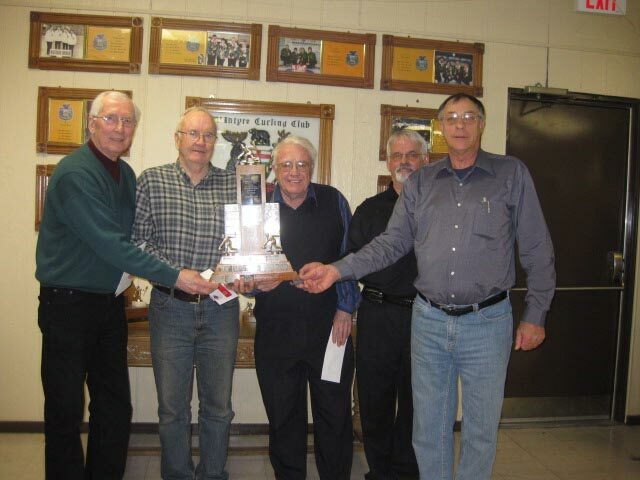 Ray presents the Tiffany Kitchens Trophy to skip Chuck Harrison, vice Malcolm MacDonald, second Richard Dickson and lead Bob Third. 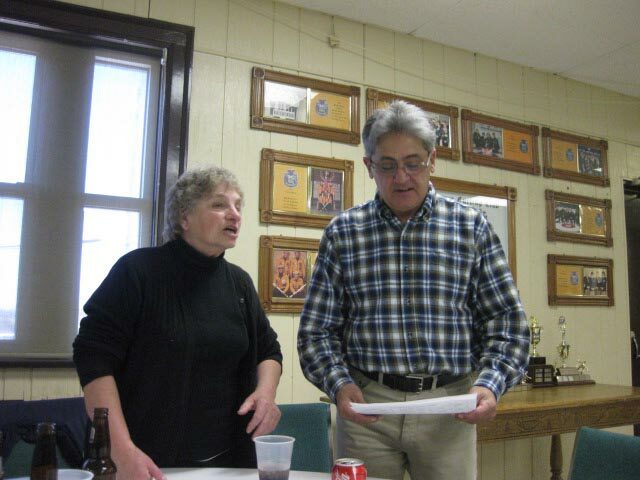 Francy Gross asks Ray Ginglo how her team placed in the bonspiel. Not good. Can you tell from the picture who won the game betweem Carmen Perrier's team and husband John's team? 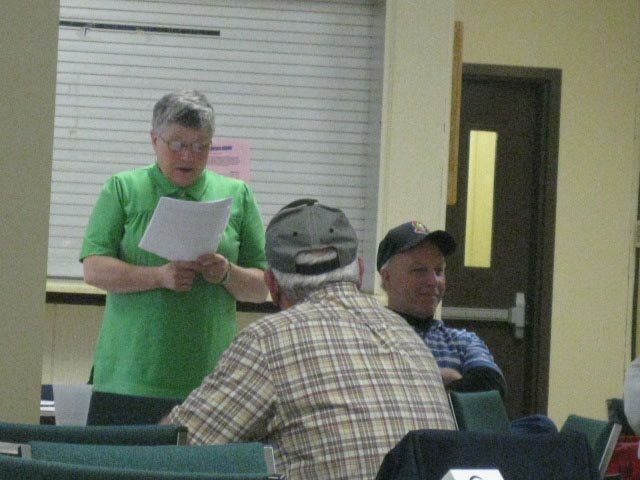 Connie Grosvenor reads the minutes of last year's meeting. Ray realizes that he will be president for another year.